On Friday night, Amherst outplayed Wesleyan in a decisive 8-0 win. Erin Babineau ’12, Josie Fisher ’12, Ashley Salerno ’14 and Ellen Swiontkowski ’12 each scored a goal, with Emily Vitale ’12 and Barrett McBride ’14 contributing two apiece. Notably, Amherst converted two of their three power plays into goals. Goalie Sinead Murphy ’12 contributed 15 saves in the shutout. Swiontkowski, Clegg, Hayley Opperman ’14, Emily Flom ’15, Avery Stone ’14 and Ashley Salerno ’14 each had an assist, Fisher and Geneva Lloyd ’13 had two and Tori Salmon ’15 rounded out the offense with three. The Jeffs then stayed the night and defeated Wesleyan again 4-0 on Saturday. “Coming back and playing hard, fast offense and solid defense the second day after winning 8-0 the day before showed that our team was focused and mentally prepared,” Vitale noted. Salmon got things started at the 8:36 mark with an unassisted goal that put Amherst up 1-0. Eight minutes later, Melissa Martin ’15 tacked on the team’s second goal, assisted by Stone and Salerno. After the break, Fisher made the score 3-0 at the 5:51 mark in the second period, assisted by Babineau and Clegg. Martin contributed the team’s final goal, and her second of the game, six minutes later, one-timing a pass from Salmon into the back of the net. Goalkeeper Kerri Stuart ’14 made 13 saves and registered the team’s second shutout of the season. With these two wins, Amherst stands at 5-1 (4-0 NESCAC). 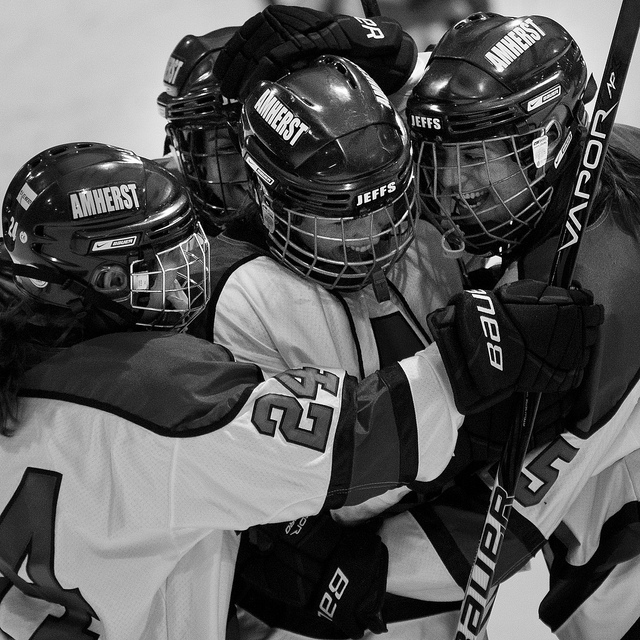 The Jeffs look ahead to two non-conference home games next weekend, facing Oswego State Univ. on Friday and RIT on Saturday.